Mopar Chrome Body Side Molding 02-08 Dodge Ram Single Cab Mopar Chrome Body Side Molding 02-08 Dodge Ram Single Cab, Mopar 82208750 Body Side Molding, 02-08 Dodge Ram Exterior Accessories, 02-08 Dodge Ram Exterior Parts, 02-08 Dodge Ram Exterior Dress Up, Dodge Ram Exterior Accessories, Dodge Ram Exterior Parts [Mopar 82208750 Body Side Molding] - $219.95 : 3rd Strike Performance, Your Source for Late Model MOPAR Performance Parts and Accessories! Mopar OEM Chrome Body Side Molding is one of the most affordable and stylish ways to upgrade the look of your Dodge Ram. These are the same moldings that are installed on the top-of-the line Ram Laramie models, giving you the ability to apply the same look to your truck. Using a highly durable ABS composite core that is chrome-plated, Mopar body side molding can endure harsh weather, small impacts, and corrosion without losing its brilliant finish. Delivering exceptional quality at an even better price, Mopar OEM Chrome Body Side Molding comes in 2-pc and 4-pc sets depending on your truck's cab style. Each set includes pieces for each side of your vehicle, and installation is made simple through the use of pre-applied, automotive-grade adhesive tape. Installation instructions and all necessary hardware is included for a straightforward attachment that provides a long-lasting bond. 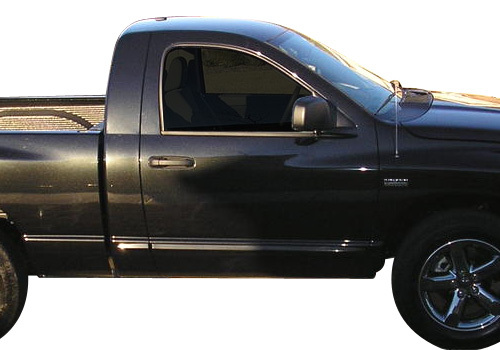 Add a bolder, streamlined look to your Ram truck with the help of Mopar OEM Dodge Ram Chrome Body Side Molding. Delivering pure OEM quality and a custom fit, you won't find a more affordable top-end product from anyone other than Mopar.